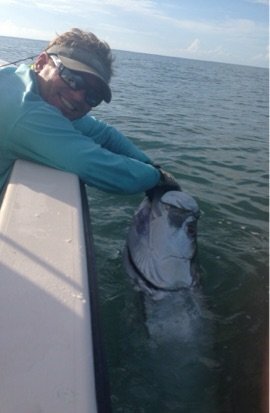 Captain Buzz with a Large Tarpon! Captain Buzz Brannon is a Northeast Florida native. Growing up around the water ways of this vast beautiful area of the sunshine state. As a young boy he was introduced to saltwater fishing on the shallow grass flats of the gulf where he targeted sea trout and redfish. Around age 10 he moved to Jacksonville Beach where he became an avid surfer and continued his passion for saltwater fishing on the inshore waters of the Jacksonville area. He has been fishing the creeks and flats off the St. John’s river and Intracoastal waterway for 20 plus years. He now takes his passion toward guiding his clients to the same shallow water game fish that got him hooked many years ago. Come see why Northeast Florida is one of the states best kept fishing secrets. Inshore fishing charters in Jacksonville, Inshore fishing charters Jacksonville Beach, Inshore fishing charters Ponte Vedra Beach,Inshore fishing charters Atlantic Beach,Inshore fishing charters Jacksonville, Jacksonville Fishing Charters, Ponte Vedra Fishing Charters.